Conserve water, save water, call it whatever you like; but our vegetable gardens can be more efficient and use less! It is so important to conserve water in your garden; even if you don’t live in the desert like I do. There are so many ways we can save water in our vegetable gardens; good for the environment and our wallets. Water is our great resource but it isn’t unlimited, and it doesn’t take a lot to reduce your usage. 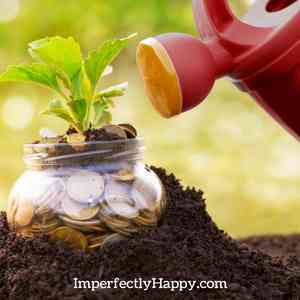 Don’t worry, I’m not asking you to let your garden die – you’re a great resource too! But I have some simple ways you can conserve water and still have an amazing harvest! Soil that has a lot of compost, worm castings and other organic material helps with the growth of beneficial bacteria and organisms that will keep the soil light, nutrient rich and requiring less water. See DIY Soil Mix. Live in a place where outside composting isn’t an option? You can still compost for your garden – give Bokashi composting a try. Planting your garden in raised beds has many benefits, one of those being is to conserve water. When you plant in raised beds, with plants closer together, you have less area to water. In traditional gardening you end up watering a lot of ground that has nothing growing. 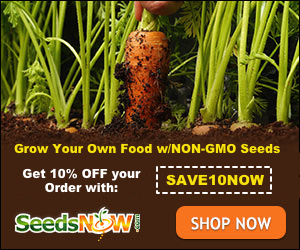 See Raised Garden Bed Benefits. You’ll be able to conserve water when you have more control over it. 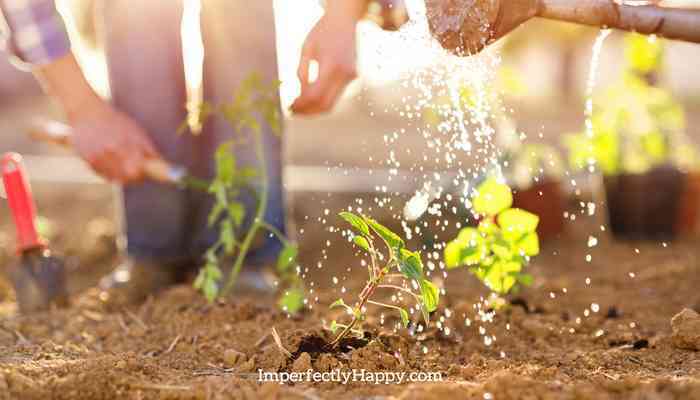 If you are a backyard gardener you may be able to water by hand with a can or hose. Another great option for conservation is the drip system – getting water right to the source! Watering with sprinklers are not efficient and will waste water on areas that are not growing. You can conserve water by watering early, so it doesn’t evaporate quickly. This morning watering is especially important in dry, hot climates like Arizona. Weeds use water! If you want to conserve water for your vegetable garden then you want to make sure that weeds aren’t using it! They’ll use your nutrients too – total opportunists. Mulching your garden can conserve water AND strengthen your soil! Mulch will insulate your soil, slowing down evaporation and keeping it from becoming hard. Soil that is mulched maintain more even temperatures and are cooler in the summer. You can mulch with many different materials with different added benefits. Check out Mulches for Water Conservation for lots of information! Not every zone is planting and growing the same vegetables at the same time. You’ll be able to conserve water in your garden by simply planting the vegetables that do best for your zone and season. If you’re trying to grow lettuce in the desert, during the summer; you’re going to use A LOT of water and be utterly frustrated. Find your zone and get in touch with your local extension office for planting calendars. Gather that water that falls from the sky, for free! Having rain barrels allows you to capture water during the wetter seasons for use later. The investment may be a bit upfront but it will pay off in the long run. If you like a DIY project, you can try your hand at making your own rain barrel. You can use grey water in your vegetable gardens. This should never be water that has come in contact with cleaners, human waste or other chemicals that could be harmful to people, animals or plants. Check out Greywater Reuse – tons of information on collection and use. If you’re ready to start saving water in your garden you can pick one or two things ton this list to try. You don’t have to do everything I have listed to conserve water in your garden; start where you can! The longer you garden the more you can implement these ideas and tools into your backyard homestead. I find it helpful that you suggested that a homeowner should invest in watering by hand using a can or hose to conserve water. Aside from that, one can also ask a local drilling service to install a water well in one’s backyard. Doing this will help a homeowner save on using the main line.